1923, 8¢ olive green, o.g., never hinged, perfectly centered with evenly balanced all around, rich radiant color and Post Office freshness, an Extremely Fine gem, a magnificent 4th Bureau issue. 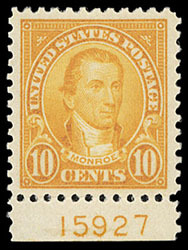 1923, 10¢ orange, bottom margin plate number "15927" single, o.g., never hinged, choice centering amid large well balanced margins, fresh with radiant color, Extremely Fine to Superb; with 2002 P.S.E. certificate Graded (XF-Sup 95, SMQ $200). 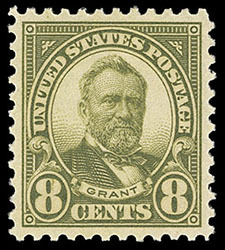 1922, 15¢ gray, o.g., never hinged, precision centering and large well balanced margins, fresh with rich vivid color, Extremely Fine to Superb, a striking gem; with 2013 P.S.E. certificate Graded (XF-Sup 95, SMQ $200). 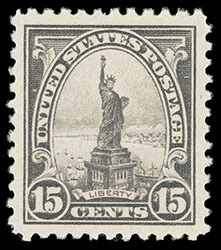 1922, 15¢ gray, right margin plate no. 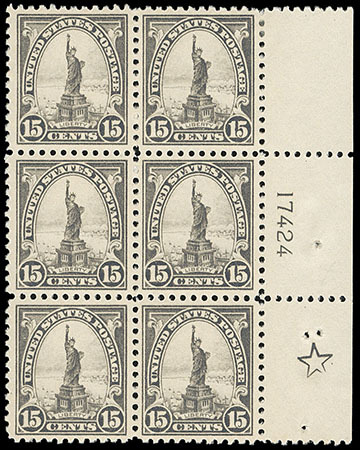 "17424" block of 6 with large five point star, o.g., top right stamp small h.r., others never hinged, nice overall centering, fresh with rich color, Very Fine and choice. 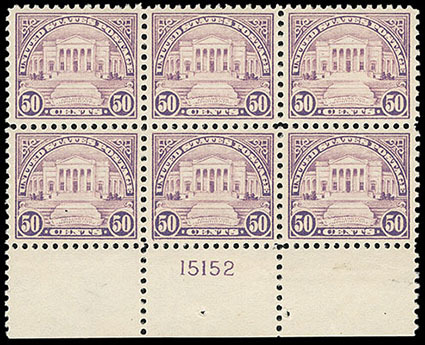 1922, 50¢ lilac, top margin plate no. 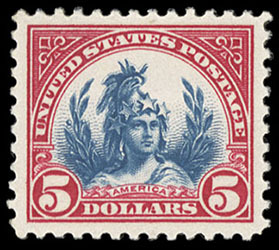 "15152" block of 6, o.g., top center stamp lightly hinged, others never hinged, bold color, choice overall centering, Extremely Fine. 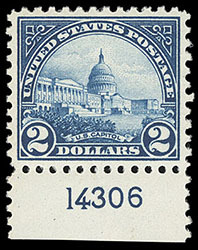 1923, $2 deep blue, bottom margin single with plate number, o.g., never hinged, evenly balanced margins and perfect centering, rich deep color, Superb, an exceptional plate number single; with photocopy of P.S.E. certificate verification Graded (Superb 98, SMQ $700). 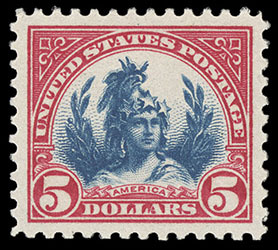 1923, $5 carmine & blue, o.g., never hinged, perfect centering amid large evenly balanced margins, rich radiant colors, bright and Post Office fresh, Superb, a marvelous gem high value; with 2014 P.S.E. certificate Graded (Superb 98, SMQ $1,150). 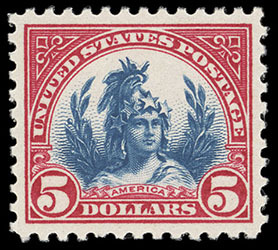 1923, $5 carmine & blue, o.g., never hinged, precision centering and beautifully balanced margins, Post Office fresh with rich colors, Extremely Fine to Superb; with 2018 P.S.E. certificate Graded (XF-Sup 95, SMQ $425). 1923, $5 carmine & blue, o.g., never hinged, near perfect centering amid large evenly balanced margins, radiantly rich colors, an Extremely Fine gem. 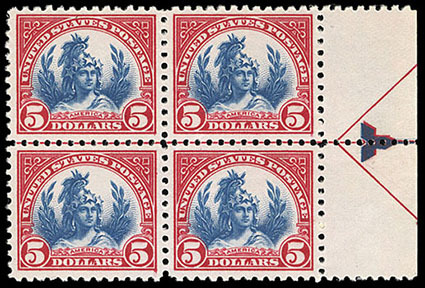 1923, $5 carmine & blue, right margin arrow block of 4, o.g., never hinged (bottom left stamp with small gum skip), choice centering throughout, vibrant colors, fresh and Extremely Fine. Scott No. 573 $720 for singles.